Cycle times, productivity and product rate are all factors which affect the bottom line – and promising to boost them all is the new EWTC thermoregulator, available from process cooling specialist IsoCool. This British-built water temperature control unit boasts a range of features, such as solid state relays and PID control for exceptional temperature accuracy, all designed to optimise manufacturing efficiency. What’s more, the EWTC is offered at a highly competitive rate, making upgrading more achievable and maximising return on investment. Ensuring precise temperature control for injection moulding machines, cylinders and extrusion barrels is key to improving product success rates. In the EWTC this is achieved via intelligent PID control, which regulates process temperature to better than +/- 1°C during heating and cooling phases. This constant monitoring of process temperature makes the EWTC particularly beneficial to systems with variable loads, as it automatically helps the unit to compensate for any changes. 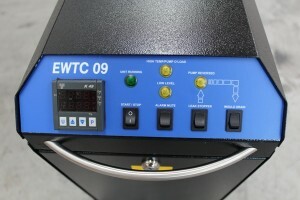 In addition to advanced microprocessor technology, the EWTC comprises an indirect heat exchanger for process cooling, and solid state relay controlled immersion heaters for quiet, reliable and fast operation. The solid state heater switching – combined with the PID controller – also offers fast ramp-up time with minimal overshoot. A submersible centrifugal pump ensures that the process fluid circulates at a constant pressure and flow rate. For extra dependability, the EWTC features an audible alarm which sounds if the temperature falls outside of the desired range. Furthermore, in the unlikely event of a leak a mould leak stopper is included to act as a failsafe mechanism. Ease of use is evident in all aspects of the EWTC’s design. For example, the controller has an easy to read LED display, a mould drain system which saves time during mould changes, and automatic water make up. PID loop settings – while fully adjustable – are factory set at optimum levels. For fast and efficient servicing the units have a hinged top cover for easy access to the manual filling pipe, auto-fill valve, and for checking pump rotation. In all models, the side and end panels can be removed for servicing main components, such as the pump and solenoid valves. The EWTC is available in 9kW heating capacity, and can be used in a wide range of industrial applications including plastic, rubber and die-casting, jacketed vessels, printing presses, and chocolate production.